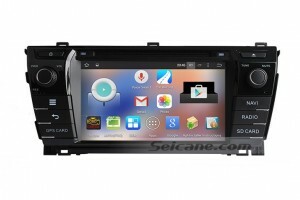 Here comes an advanced Toyota Corolla car stereo for manufacture year of 2013 and 2014 from Seicane. It is upgraded on both software and hardware to high configurations. It comes with a large amount of features which include GPS navigation, Bluetooth technology, DVD player, FM/AM radio, RDS, TV, WIFI, USB, SD, etc. Great convenience and pleasure are available for you when you are driving in your car. A multifunctional car stereo will absolutely bring you a different driving experience, that’s why replacing the factory radio with a new aftermarket car stereo has become a trend. There are many functions in this 2013 2014 Toyota Corolla car stereo, if it’s the first time for you to use a modern aftermarket car stereo, you may be confused on how to use it. This passage mainly introduces how to set settings this Toyota Corolla car stereo, so you can take it as a reference. First of all, you turn on the stereo and enter the main menu. Find the setting logo and click it. Then you can go to the setting interface. There are many logos for the functions provided by the stereo. You can set what you like according to your need. Let’s talk about how to connect internet first. You find the IE setup interface in the setting interface and click WIFI connection, connect the WIFI that is available for you. After that, you can go back to the main menu and click the IE browse to surf the internet. In addition, you can also connect a 3G module to get access to internet. Next comes the usage of GPS navigation. To use GPS function, you need to install maps in it. You can insert an SD card which include maps you download from your internet before. Then set the GPS path to install it. After accepting all the agreements, you can easily install the maps in this stereo. When you begin to use it, input starts and destination in the maps, then it can provide turn-by-turn direction and voice prompts to guide you to a lot of locations. To listen to music, you can set the audio balance in the setting interface. You can also adjust the brightness, car logo, wallpaper to meet your own mood. Besides, this Toyota Corolla car stereo can support 37 kinds of languages, including Chinese Traditional, Chinese Simplified, Japanese ,Korean ,Arabic ,English (Australia),English (Canada) ,English (new Zealand),English (Singapore),English (United kingdom),English (United States) ,Afrikaans, Bahasa Indonesia ,Bahase Melayu ,Deutsch(Deutschland), Deutsch(Liechtenstein), Deutsch(schweiz), Filipino, Fancais(Belgique), Fancais(Canada), Fancais(France),Fancais(Suisse),Italiano(Italia), Italiano(Svizzera), Kiswahili, Latviesu, Magyar,Nederlands, Norsk bokmal,Polski, Portugues(Brasil), Portugues(portugal), Rumantsch, SlovenCina,Suomi, Svenska ,Pyccknn. Therefore, you can set any language in the setting interface to meet your different needs. There are many other functions which can be set in the settings, you can click them and easily set the value according to your preference. 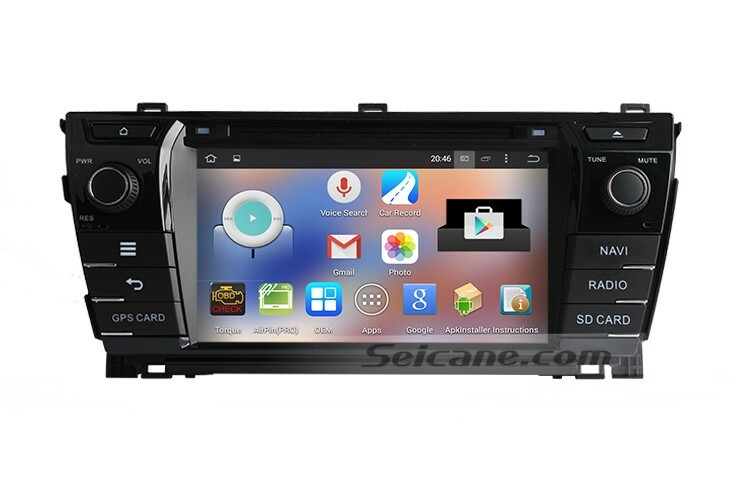 For the details about the functions, you are welcome to click the following link which is about this Toyota Corolla car stereo from Seicane. Wish you have a wonderful time with this Toyota Corolla car stereo and enjoy all your trips from now on!